My bicycle has been sent home. That thing on top of my boxed up bike is a skateboard. On it I will skateboard the rest of the way to England. Along the Rhine river it is! Once in England I will figure out the logistics of skateboarding across North America. If successful, I will be the first person to skateboard across North America solo and unassisted. I will be carrying all I need to survive on my back in a backpack. It currently weighs about 8kgs without food or water. For the past week I have been in Leysin, Switzerland. It has been a wonderful end to a great season with Village Camps. I really enjoyed working with the staff, and this week’s students were a definite highlight. On Monday the 25th of June I will walk down the hill with my skateboard in my hand and my backpack on my back. It will all begin again. How will I slow myself down on the hills? How will I save my shoes from excessive wear? How will I measure my speed and distance covered? What will I be carrying? How did I come up with this new challenge? So Europe roads were proving just too tame, eh? Not adventurous enough after Central Asia? Are you allowed to Skateboard on main roads or are there bike paths you can use all the way to England? And North America-looks like your next few years are going to be all about adventure. I look forward to your explanations etc. on this change. You are DEFINITELY going to have to write a book when you FINALLY finish! I'll even offer to be your editor. I was rather looking forward to seeing sooner rather than later. Maybe Dad and I are going to have to have a trip to meet you somewhere. By the way, am I allowed to use your bike when it arrives? I am beginning to think you have become addicted to adventure!!! It becomes rather a lonely life after a while – no long term friends or relationships – always moving on. I am a little disappointed that you did not finish the trip you set out on. That is to ride your recumbent bike all the way to London. Changing vehicles before the end sort of invalidates the whole thing. Sorry for sounding a bit negative, but at my age, just thinking about skate boarding all that way makes me feel very very tired indeed! I hope you don't end up with one leg shorter than the other!!! Praying lots of prayers for you. Oh well once we started, we can not stopped it. Go for it. Definitly looking forward to see new updates with great photos as always. Enjoy. Play it safe. And plenty of nice people & great momments. Great to finally get a new update and learn what you are up to. All I can say is "Huh?" This new mode of travel comes totally out of left field for me. I will be very interested to see how this adventure of yours proceeds from here. I am also a little sorry to see the bike go, but since you seem convinced to try and get into the Guiness Book I will just wish you well and continue to enjoy your journey. If you do go to the US be sure to swing on by Madison for a day or two. Not a bad place, lots of bike paths….just not in the winter. You would need a snowboard for that. We agree with Tim, but no just a nut – a jolly nut. they are pretty close from each other. DooDah is a bit bigger so they might have more tools than escape. off course you are nuts. But that is the reason, why this blog is that interesting as it is. 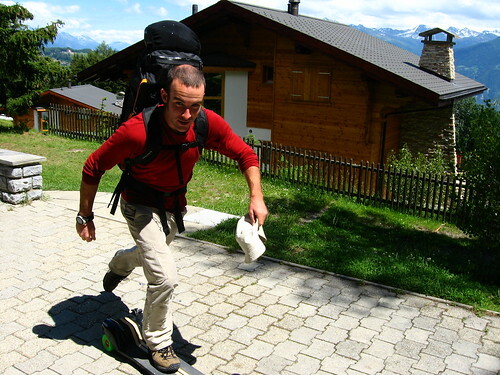 How many kilometer a day you can go with the skateboard? This will be a pain to your feet and knees, I guess. But anyhow. I hope we can meet somewhere between Cologne and Düsseldorf at the Rhine-River in a few weeks. Have fun. Go Rob! Missed your blog ~ I have no doubt you've been inspiring guys and gals with your participation and enthusiasm at Village Camps. I love your challenge ~ look forward to following you across NA. I've followed you from your first tentative ride to work familiarising yourself on the recumbent ~ and wow didn't you embrace that challenge! Why not get a charity involved ~ hope and homes for children for example. I'll put £50 down now, and NA is a rich country. Just a thought mate. Have you been out in the sun too much? Please put your hat back on…and drink some water! Anyway best of luck with it all I'm sure you know what your doing…. ya right! but this does mean I won't get a go on the bike! Cr4p I was looking forward to that! Hey, Rob: Radical switch of modes for your journey! Contrary to some others, I hardly think it "invalidates" your journey. It makes the final bit that much harder! Looking at the deal from a purely sort of "rules-based" or philosophical gaming point of view, I'd say you'd have to rent a car or hop a train to "invalidate" this trek you are on. But how could you part with the Street Machine?! You'll miss her on some of those long stretches across the Mid-West. Maybe we'll meet up somewhere in the United States. I'll probably be the only guy out on the roads with a Street Machine and yellow, Radical panniers. As a recumbent bicycle driver, I agree with some of the writers: I'm a little disappointed too to read that you switched from recumbent to skate board. Nevertheless, it's good to read that you are on the road again and we still love to invite you for (a few) day(s) in our house just north of Rotterdam, Holland. Are you still planning to come to Holland after all ? Hi Rob – wow – you got yourself a nice little skateboard there! Good luck with the continuation of the journey. I am in awe of the fact you're carrying it all on your back – something I find pretty tough to do! Get yourself a good pair of shoes, and prepare for one of the most interesting methods of transportation you'll ever take! We will be scanning the horizon on the Atlantic waiting your arrival in the US of A. If you make it down to North Carolina you have a place to rest your head. Great working with you last week. All the best with the journey up to London. Watch out for these european nutters in cars. I'll be keeping track of your progress. Cheers, Dan. Don't worry about "invalidating" your trip. It's the journey that counts. While recumbent aspect was personally interesting, any way you complete the trip works. We are definitely excited and curious to see how the skateboarding goes! Can't wait to read the bog again. If we are back in the US, you are definitely welcome to stay with us. We'll let you know where we are! Look fwd to the continued updates! What wordpress plugin do you use to manage the social buttons? does not work and leads to a busted page. I am aware I’m doing something wrong.